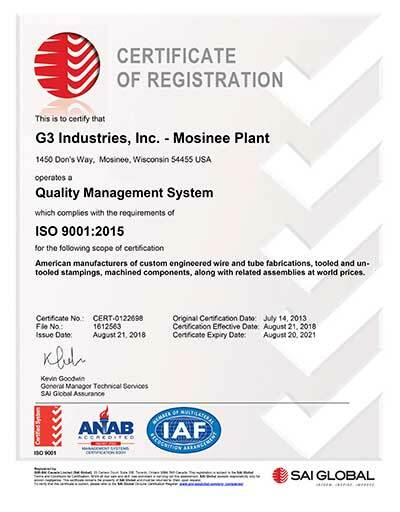 G3 manufactures products of uncompromised quality with the goal of total customer satisfaction. Each employee is responsible for the quality and outcome of their workmanship. We deliver consistent growth and profitability by working as a disciplined team to continually improve of processes. G3 will strive to be the employer of choice and a partner to the community. 1 - Brown & Sharpe 9128 Global Image Coordinate Measuring Machine (CMM) equipped with a SP600 Renishaw Scanning Probe; working capacity 01 X40.0 Y78.0 Z27.0 Inches. Scope of Registration - Contract Precision Machining and Assembly.